Staff at a Stirling building firm are celebrating after winning a top business award. Bridge of Allan-based Kevin Wilson Joiners & Building Contractors was named Small Business of The Year at the Scottish SME Business Awards. They beat off competition from nine other shortlisted companies for the honour which was based on public nominations. It is the first award won by the company founded by husband and wife team Kevin and Pam Wilson just over 10 years ago. “We are so chuffed to win and even more so because we were nominated by our clients who are the people that matter most to us. “It’s the first time we’ve been nominated for an award so to win was just amazing and really rounded the celebrations for our 10th anniversary year off perfectly. “We were up against quite a lot of other companies so didn’t really expect to win and were quite surprised when our name was called out. “We had to go up and say a few words about the company and what we really wanted to get across is that the award is very much for our whole team who are so loyal and hard-working. 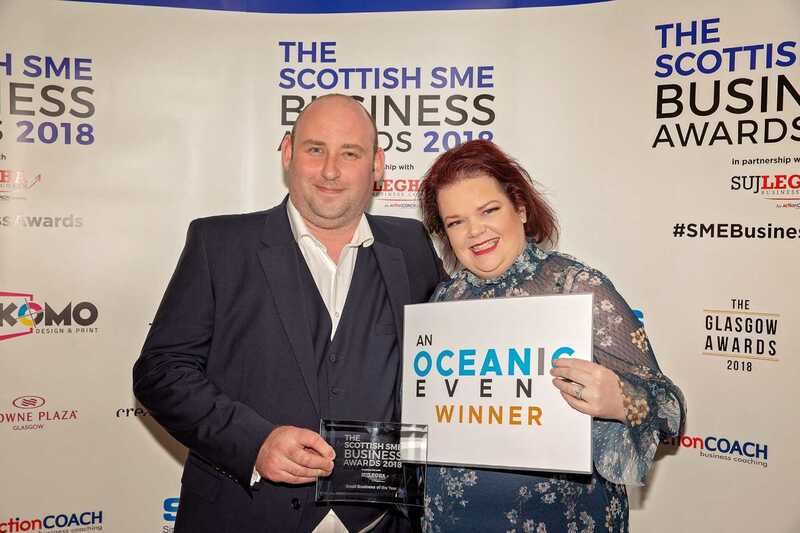 The Scottish SME Business Awards were launched last year to celebrate the contributions made by small businesses and entrepreneurs. They are organised by Creative Oceanic and see members of the public nominate and vote for the highest achieving companies in various categories. The awards were presented with awards in at a glitzy ceremony in Glasgow hosted by presenter and DJ Josie Smith and STV presenter Zara Janjua. Kevin Wilson Joiners were among a diverse range of ten companies shortlisted for the Small Business honour including a St Andrews cleaning firm, a Perth women’s clothing outlet, a Forfar-based PR business and a digital marketing agency in Glasgow. “It was a great pleasure to meet some truly inspiring individuals with successful businesses. “The success of the awards is directly related to the advancement and continued prosperity of Scotland’s SME business community. “I would like to congratulate all the finalists and winners for their hard work and achievements. Kevin Wilson Joiners & Building Contractors, which was established in September 2007, covers all types of building work from residential renovations and extensions to commercial projects. The firm is also well known for its charitable efforts raising funds annually for local charities So Precious and The Eilidh Brown Memorial Fund as well as sponsoring and donating bespoke joinery items for their events. Published by Blackburn Communications on May 1, 2018. As featured in Scottish Business News Network, Scottish Construction Now, The Stirling News and Family Business United.